With the first phase of voting in the 2019 Lok Sabha elections less than a week away, media commentators appear to have developed consensus around three factors. First, Prime Minister Narendra Modi is by far the most popular leader in the country today. Second, despite Modi’s popularity, the Bharatiya Janata Party is unlikely to repeat its 2014 performance. It may emerge as the single largest party by a wide margin, but crossing the majority mark on its own would be a miraculous achievement. And third, Rahul Gandhi and the Congress party seem to have lost the momentum generated in the aftermath of the party’s victory in the December 2018 Assembly elections. Read the detailed Trust Vote survey by Firstpost only on News18.com. The day Congress president Rahul Gandhi filed his nomination from Wayanad in Kerala, political action also picked up the pace in Amethi, his traditional constituency in Uttar Pradesh. While Gandhi’s ‘southern march’ is gradually becoming a topic of discussion in village markets and chai shops in Wayanad, in Amethi, BJP candidate Smriti Irani has raised a political storm by launching a fierce attack against the Congress president, calling him the “Missing MP”. Read the News18.com analysis. A group of Hyderabad residents have brought out a new campaign ahead of Lok Sabha polls. Fixing the water crisis in Krizra enclave and Krizra colony of Hyderabad, Telangana, which has haunted the residents for a while now, is their main demand. Read more. Actor-turned-politician Hema Malini has once again struck the chord of rural connect. Days after kick-starting her election campaign from the farms of Mathura, Malini drove a tractor in a farm in Mathura’s Givardhan. Clad in pink saree, the sitting MP from Mathura posed with a victory sign from the tractor. Read more. Karnataka chief minister and JDU leader HD Kumaraswamy got emotional again during a rally and begged people not to fall for Narendra Modi's "colourful" words. He claimed a military officer had told him two years ago that PM would "build a story" around elections to get votes. "I'm pleading with you don't believe PM's colourful words. A leader supported by regional parties would form the next government at the Centre, said Nara Lokesh, the Andhra Pradesh minister and son of Chief Minister Chandrababu Naidu. Speaking to News18 from his constituency, Mangalagiri, Lokesh said, “Prime Minister Narendra Modi will surely lose power and a new leader would emerge as the PM candidate with the support of regional parties like us. I cannot say whether Congress president Rahul Gandhi will be the PM. We have two more months to go and anything may happen during this time.” Read more. The news of Bimal Gurung’s possible return, after hiding for nearly two years, to Darjeeling spread like wildfire on Thursday. Absconding, since the state government brought numerous criminal cases against him in connection with the 104-day agitation between July and September 2017 that left 13 dead in the ensuing violence, Gurung had been the unchallenged ruler of Darjeeling from 2008 to 2017. Read Bimal Gurung's complete profile. The Supreme Court on Friday refused urgent listing of a plea seeking stay on the release of biopic on Prime Minister Narendra Modi. Meanwhile, in a development, producer Sandip Ssingh has shared the new release date of PM Narendra Modi, starring Vivek Oberoi. He announced the release date as April 11. Read more. Nine years after the bitter break up with Congress, YSR Congress Party chief Jaganmohan Reddy on Friday said that he has forgiven the party and does not hold any vengeance. Read the full interview. Read all stories related to Lok Sabha Elections 2019 with News18.com's LIVE election tracker. A report claimed that a US count of the F-16s with Pakistan found that none of them are missing, contradicting India's claim that one of its fighter jets shot down a Pakistani F-16 during an aerial dogfight on February 27. In response, Indian Air Force has confirmed that Wing Commander Abhinandan had indeed shot down a PAF F16 aircraft seven to eight kilometres inside Pakistan Occupied Kashmir in Sabz Kot area. Read more. Congress president Rahul Gandhi on Tuesday released its much-awaited manifesto for the upcoming elections. It is disappointing that the vision of the grand old party’s manifesto is a far hark from facts. Read Shshank Saurav's take on the Congress' manifesto's big promises that ring hollow. 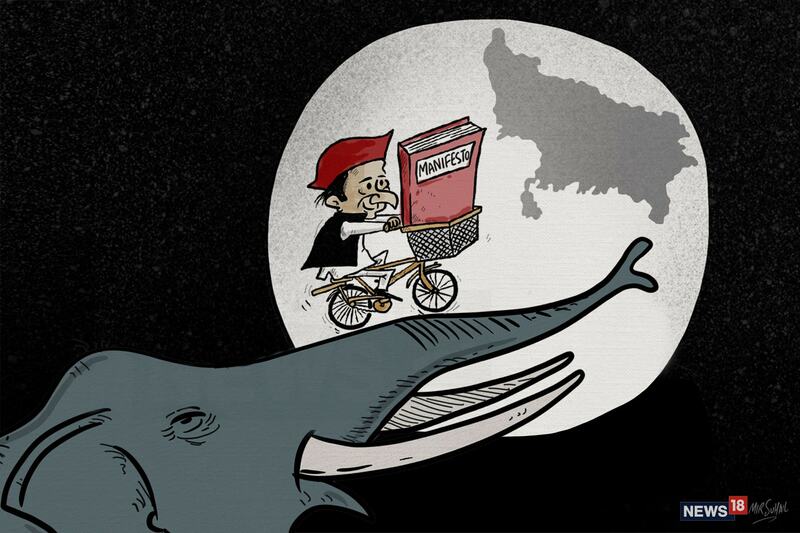 The Samajwadi Party’s vision document released by its president Akhilesh Yadav on Friday has come as the final manifestation of the political narrative that both the SP and the BS had set out to work on vigorously after their electoral humiliation in the assembly elections of 2017 - the narrative of backward castes, Dalits and minorities against the upper castes. Read more.